Abi's sound asleep. We are after the night routine, that is getting better and better every day, namely less fussing before going to bed. Sometimes, I think she reminds herself: " hey, I haven't cried all day, that's my last chance today'.. In other words, she is such a content baby. She cried only 2 times today, both times when she was super hungry and I was super slow, preparing all the ingredients for supper: milk with rice cereal and a banana.. It was a feast this afternoon. For example, today, she started raising her hands as I approach her and tell her to "come to mommy". I don't pick her up until I say that and wait for her response and sometimes I lift her hands, so she knows what to do when she wants to be picked up.... She's such a fast learner!! 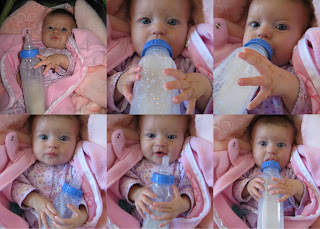 Also, for the first time she held her bottle and drank from it!!! I still am unsure whether it was a planned action, but it looked like it was intentional.. and she looked a.d.o.r.a.b.l.e.!! Tomorrow, our first follow-up visit with the cardiologist. We are bringing the chest x-rays we did today for him to review. It was quite a ride with the radiology technicians today. They asked us back 3 times to take pictures, after we continued to dress and undress Abi and headed to the registration area to wait for the pictures... 3 times!!! Unbelievable! And every time, we had to unstrap and take Abi from the car seat, undress her and put her on the uncomfortable, hard table in 2 different positions, dress her back up, put in the car seat and leave the radiology room. At the third time, I requested to stay in the room and wait for the technicians to come back to let us know if the pictures were clear... third time lucky..., so Merry Christmas and 1,5hours later we were done. Oh, and the x-ray pictures take 3 seconds for those who may wonder. With a hint of sarcasm and a spice of humor... I'm saying: "better those pictures are really goood!!"